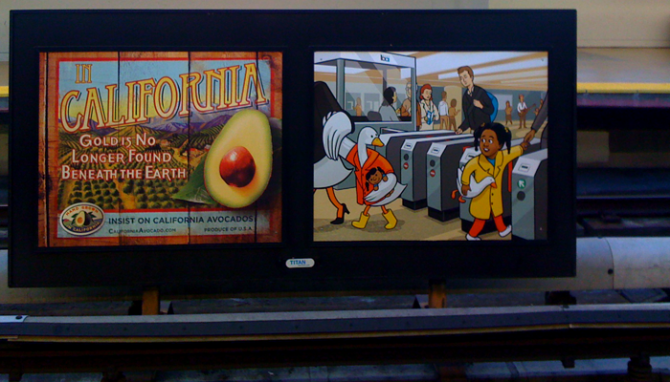 I love public art, and this new series of surreal scenes on (and about) BART is charming. A few weeks ago I snapped this poster of the little girl and the duck at my local BART station, wondering what it was. Other than the station scene, the poster offered no clues to the purpose or message. Fortuitously, a Facebook friend posted a link to this article about the posters, which are whimsical stories created by Josh Ellingson. In each scene a child’s fantasy crosses over into reality — a boy with the undersea-themed backpack spots a deep sea diver with a squid, a boy with a toy rocket sees rockets zooming past through the window, and a girl with a toy duck passes a duck with a toy girl. While they celebrate the adventure of travel, in keeping with transit poster tradition, they are mostly just plain fun and avoid seeming like ads. Transit art is my favorite type of public art because it adds much-needed lightness and beauty to what is so often drudgery. Years ago while commuting on a bus in Chicago, I saw an excerpt of a Mark Strand poem about a snowflake that affected me so much I was inspired to jot down the name and buy the book. (And I’m not even a poetry fan!) Recently on the Metro light rail in Phoenix I also spotted mosaic sculptures built into platform shelters. There is currently a MOMA exhibit of London Underground posters from the 1920s-40s, including pieces by E. McKnight Kauffer (one of my favorites of the era) and László Maholy-Nagy. Unfortunately this kind of poster has largely disappeared, replaced by commercial ads, but sometimes we get lucky and find ones like the new BART series or the iconic national parks posters by the amazing Michael Schwab. I hope to see more art like this popping up. The Bay Area has a tremendous wealth of artists and stories to tap into, and in these tough times we could all use more beauty and levity around us.